About 56% of all U.S. homes have at least one TV set connected to the Internet via a gaming console, a Blu-ray player, a smart TV or through a stand-alone player such as a Chromecast adapter, Roku, Apple TV, or Amazon Fire TV device, Leichtman Research Group found in a new survey. 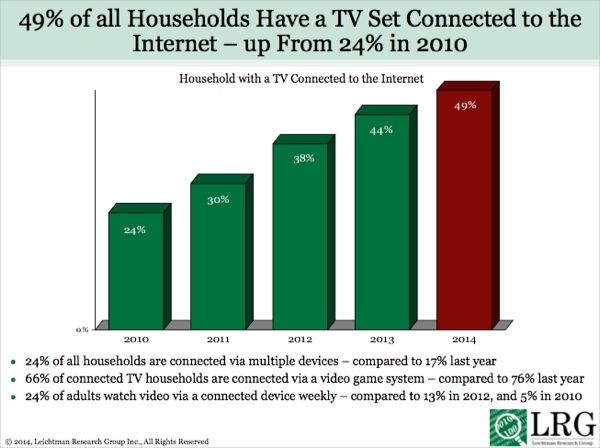 That’s up from 44% in 2013, and 24% in 2010, LRG said, adding that that 27% of all U.S. homes now have a TV connected via one device, and 29% are now connected through multiple devices, up from 17% in 2013. In terms of usage, LRG found that 29% of adults watch Internet TV platform-delivered video via a connected TV at least weekly, compared to 17% in 2013, and 5% in 2010. Among Netflix streaming video users, 85% said that they watch Netflix on a TV set – a slightly higher level than in any previous year, LRG said.